Suarez row: Biter's fate in local hands? The fate of controversial footballer Luis Suarez could now lie in the hands of a Bermudian — our football association president Larry Mussenden. He chairs a FIFA panel that is likely to hear an appeal against a four-month ban imposed after a World Cup biting incident. Mr Mussenden confirmed his role by text from Brazil yesterday. 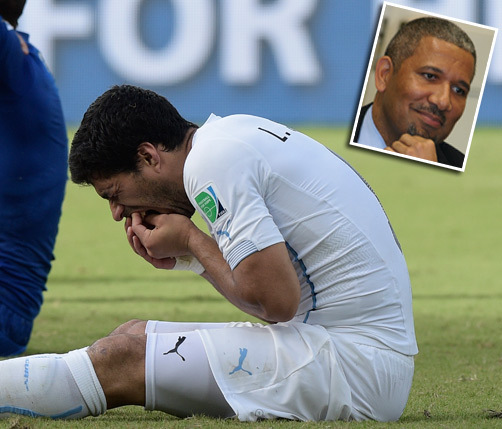 Bermuda football legend Clyde Best said Luis Suarez acted like a ‘pitbull’ and should have been banned for a year. The Uruguay striker was yesterday banned for four months worldwide from any footballing activity, banned from international football for nine games and slapped with a fine of $118,000 for biting Italy defender Giorgio Chiellini on the shoulder. But former West Ham winger Best, 63, said the Liverpool man was fortunate not to get longer. “He’s pretty lucky if you ask me,” he told the Bermuda Sun. “If it had been down to me, it would have been harsher than that. “He’s done it three times now! The game has no room for that sort of behavior. He did it — there’s no doubt about that. He was like a pitbull, the way he attacked him. “I’d have given him a year, myself. It’s ridiculous. He’s done it in Holland, in England and now the biggest stage of all, the World Cup. It’s embarrassing for his family and his country. Meanwhile, Bermuda FA president Larry Mussenden could soon find himself at the heart of the biting scandal. The Uruguayan FA has said they will appeal the ruling, which they describe as “excessive”, insisting there was “not enough evidence”. FIFA procedure states the matter then goes to FIFA’s Appeals Committee, of which Mussenden is chairman. If still unhappy with the verdict, the Uruguay FA can then take their appeal to the Court of Abitration. It’s the biggest ban handed down in World Cup history. Former Attorney General Mussenden has recent experience of high-profile football cases, having chaired the Appeals Committee that suspended the transfer ban imposed on Barcelona for breaching rules on signing under-age players. Suarez bite controversy: What do you think? Bubble football: A solution to the Suarez problem?